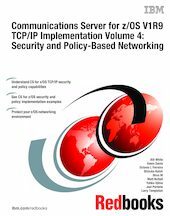 This Communications Server (CS) for z/OS TCP/IP Implementation series provides easy-to-understand, step-by-step how-to guidance on enabling the most commonly used and important functions of CS for z/OS TCP/IP. With the advent of TCP/IP and the Internet, network security requirements have become more stringent and complex. Because many transactions come from untrusted networks such as the Internet, and from unknown users, careful attention must be given to host and user authentication, data privacy, data origin authentication, and data integrity. In addition, there are certain applications shipped with TCP/IP such as File Transfer Protocol (FTP) that, without proper configuration and access controls in place, could allow unauthorized users access to system resources and data.